for hospitals and their patients. Clean Collect is the solution! Blood culture contamination results in unnecessary treatment of an estimated 1.2 million patients each year and costs totaling over $15.3 billion annually for hospitals worldwide. These expenses are typically not reimbursed by Medicare and most private insurers, resulting in considerable financial loss for hospitals. “The costs of correcting a defective product often exceed the cost of designing a system to avoid producing the defect. Costs of $6,283 per incidence that can total several million dollars each year. Affordable kits that are compatible with all major blood culture systems. Clean Collect® uses a patented diversion system to significantly reduce blood culture contamination rates and achieve long term control of the problem. This system has proven effective in published controlled clinical trials and in practice at hospitals and ERs dealing with difficult contamination issues. Clean Collect prevents contamination using a patented diversion method. Average cost per contaminant has been measured at $6,283 in published clinical trials. These costs are not typically reimbursed, and can often total in the millions annually for large hospitals. Contaminated blood cultures result in or prolong unnecessary treatment with broad spectrum IV antibiotics. This can lead to C.difficile infections, kidney and liver damage, and anaphylactic shock. Primary source of contamination is the ER where blood cultures are often drawn through IVs by nurses. However, phlebotomy teams have also improved with Clean Collect®. IS CLEAN COLLECT® A COST EFFECTIVE SOLUTION? Clean Collect® typically saves hospitals about $82 for every $1 spent on the product. HOW EFFECTIVE IS THE DIVERSION METHOD? The diversion method has demonstrated the ability to reduce blood culture contamination rates by 50 – 84% in clinical trials on over 8,000 hospital patients to date. HOW DOES THE DIVERSION METHOD PREVENT CONTAMINATION OF BLOOD CULTURES? The diversion method clears potential contaminants from the blood collection needle before collection of blood culture samples. WHAT ARE BLOOD CULTURES USED FOR? Blood cultures are used to detect septicemia. Septicemia is a life threatening illness that results in the presence of bacteria in the patient’s blood. WHAT DOES CLEAN COLLECT® DO? Clean Collect prevents contamination of blood cultures using a diversion method. What can the diverted sample be used for? The diverted red top tube sample can be used for more than 50 diagnostic tests on serum and is accepted by Labcorp, Quest, and other reference labs. These tests include: Viral (hepatitis, West Nile, influenza) Acute Phase Reactants/Markers (procalcitonin, C-reactive protein), Hormonal (thyroid stimulating hormone, thyroxine), Immunology (allergen profiles, anti-nuclear antibodies), serum antibiotic levels, and other testing. Could we use regular blood collection tubes to draw the first sample and get the same effect? Regular tubes are not sterile on the exterior. If drawn first they can carry contaminants from the tube’s stopper into the blood cultures drawn afterwards, increasing contamination rates up to 17%. Clean Collect uses a pre-sterilized diversion tube to eliminate contaminants from multiple sources without creating a new contamination problem. Manually treating tube stoppers with antiseptics has proven inconsistent in practice with hospitals reporting increased contamination rates instead of reductions. The Clean Collect® Blood Collection System uses a patented diversion method that prevents contamination of blood cultures. The diversion method reduces contamination rates by as much as 84%. The effectiveness of the diversion method has been demonstrated through clinical trials on over 10,000 patients. Clean Collect works well through new venipunctures or IV starts. IV drawn blood cultures are often a source of many contaminants at emergency departments. The new CC-310 and CC-315 (IV Start BLC Kits) have been shown to reduce blood culture contamination rates considerably when used to collect blood cultures through newly inserted IVs. 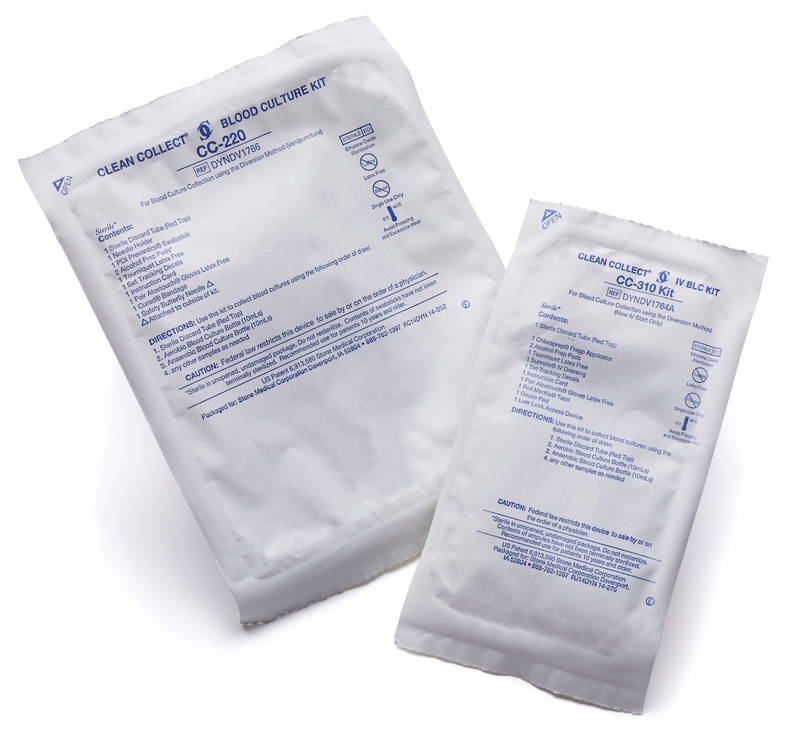 The objective of Clean Collect® is to reduce contamination rates. This benefits patients by preventing unnecessary treatment and provides physicians with a more reliable diagnostic test for septicemia. The average cost of blood culture contamination for hospitals is $6,283 per incident. Collect blood culture samples free of contaminants. The Clean Collect® Blood Culture Kit contains the materials needed to perform the diversion method. The Stone Medical Corporation is a privately held company founded to bring exciting new technologies to the healthcare market that will establish new standards of safety, quality, and efficacy. Our flagship product line, Clean Collect, proves our dedication to this mission by dramatically increasing the quality of blood cultures at hospitals. Our customers benefit from impressive cost reductions and improved patient outcomes. Our investors will be rewarded with excellent returns on their investment. At Stone Medical we are looking to improve patient outcomes and your efficiency. Don’t hesitate to reach out for more information. © 2016 Stone Medical Corp. All rights reserved.